How they work: you get liquid sodium silicate and colorful rocks (actually metallic salts). 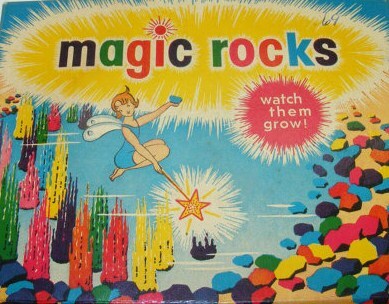 You put the rocks in a pretty glass container, and then the sodium silicate (mixed with water), and the rocks grow. I googled and this simple science toy is still around! I always liked these ... they reminded me a bit of stalagmites (I liked caves, too!) and also a bit of those color drip candles at Italian restaurants back in the day. Who remembers this science toy? I'd love to hear from you in the comments, below. I love when you do these throwback posts - they make me so happy!!! 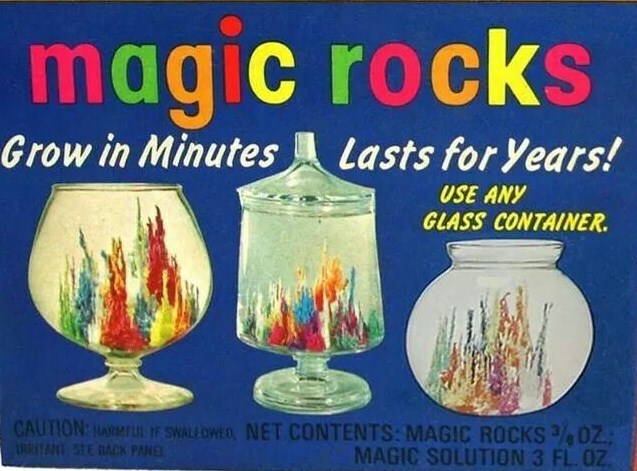 We used to have a toy store by my house growing up with all sorts of science-related DIY type of projects and toys, so I definitely remember these. What a fun blast from the past. I totally remember these! That's so cool they are still around. My son would love them. Wow, I've never heard of these but they looked like they were a ton of fun! I remember that! We never had one growing up but I think I want one now! Thanks for the visits! I enjoyed reading your retro memories.